The clock is ticking! Set your timers for High 5 Casino’s 261st game is coming soon! 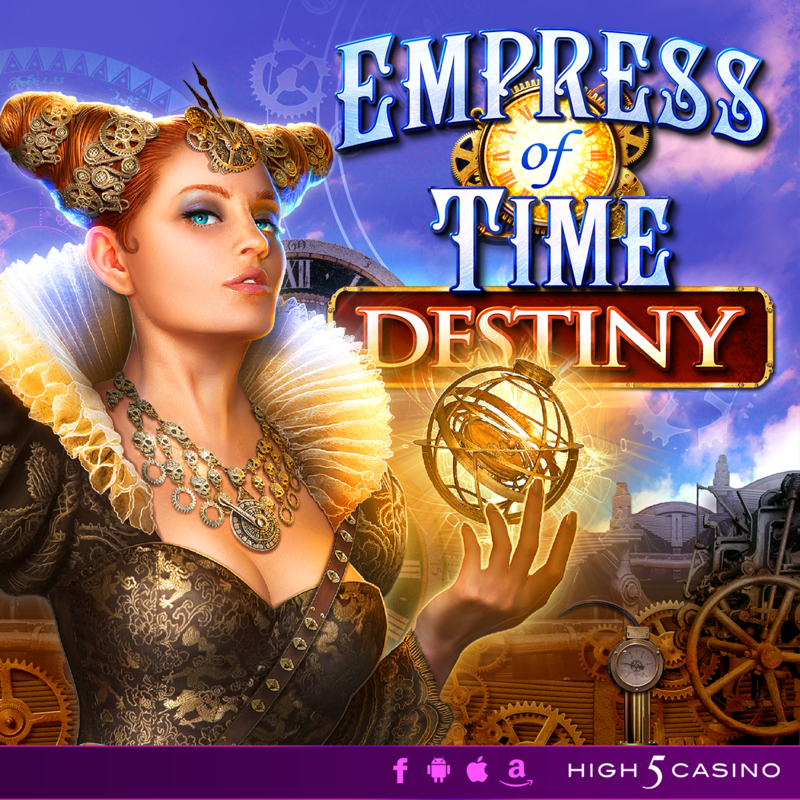 The Empress of Time has the power to control time! Join her in the battle against evil forces to prevent catastrophe upon us. Be wary of your decisions for they will define your destiny. Remember to manage your time strategically before the hourglass is turned and you’re sure to come out on top. You are destined for big wins with 243 ways to win and Bonus Select! Comment in the conversation bubble located on the top right corner of your screen and let us know what you think! Shake the Sky fan favorite Night Jasmine is now UNLOCKED for all players as the 113th slot at High 5 Casino. Below, High 5 Blog correspondent Nikita breaks down all the reasons why you should check out Night Jasmine at H5C. I’ll admit it, I’m a hopeless romantic. So when I saw Night Jasmine, and heard its back story, for the first time, I instantly fell in love. Trust me, there’s a lot to love about this game. First, the story rocks. Bound within the confines of the palace during the day due to her over-protective father, a young princess yearns to escape. At night, however, she’s able to briefly experience freedom and privacy in her secret garden. This magical place – filled with songbirds, playful frogs, and beautiful flowers — is her only refuge from a lonely, sheltered life. One fateful night, the alluring scent of a night jasmine flower draws her close, and when it suddenly transforms into a prince, her life is forever changed. Second, the game’s artwork is absolutely GORGEOUS! Yes, so gorgeous that it warrants ALL CAPS. CRAP, NOW MY CAPS LOCK IS STUCK… There we go. 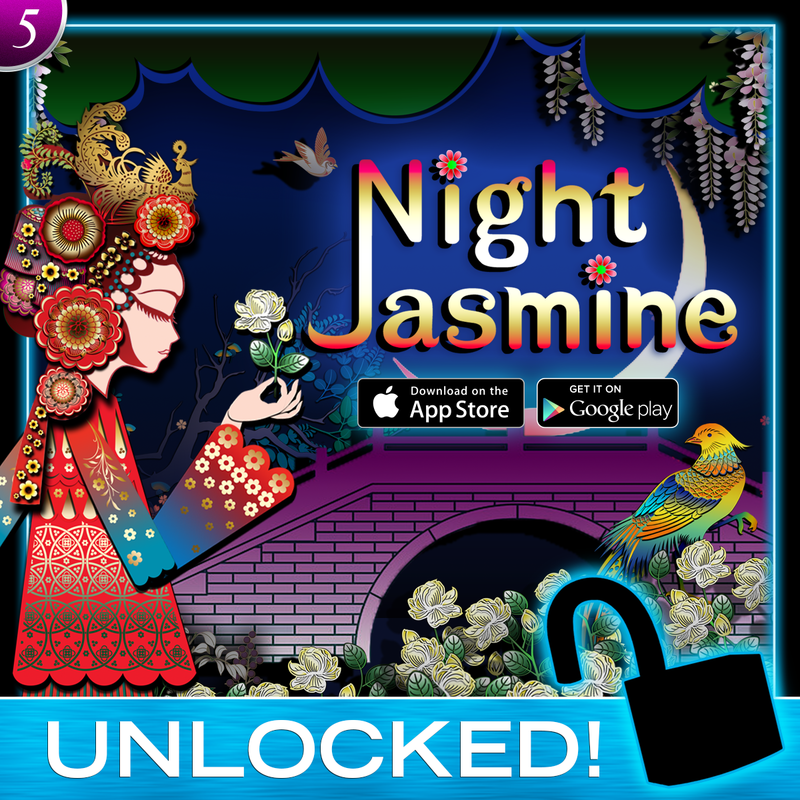 When you play Night Jasmine, you’ll instantly see that it’s unlike any other game on High 5 Casino. And that’s intentional: Night Jasmine is the first slot from High 5 Games designed utilizing the traditional Asian paper-cut style. And by using rich hues of blue, red, yellow, and green, H5G’s Red Gold studio is able to truly capture the essence of a night spent in Southeast Asia. Last but not least, the gameplay is stellar. Fans of Gypsy will fall in love with Night Jasmine’s 243 ways to win and Split Symbols, which make it possible to win up to 10 of a kind in just one spin! The retriggerable bonus round makes the playing experience even more exciting and gives players even more opportunities to score mega payouts! I could go on and on about this game, but why not see for yourself? Night Jasmine is already one of my favorite games, and I’m sure it will soon make it to the top of your list as well. Give it a spin at High 5 Casino and I promise you won’t be disappointed! Summer is winding to a close here in New York City, but Shake the Sky Casino isn’t ready to turn the page to fall just yet. Relive the glory days of summer in Tumbling Together, the 40th premium slot at Shake the Sky! It’s a hot summer day; what better way to spend it than rafting down a beautiful river with four of your zaniest friends? In Tumbling Together, you can do just that! Hop in a barrel and float along with a panda, fish, rooster, and pig. Get ready for a big drop – there’s a waterfall just up ahead! If you’re in the mood for summer fun, there’s no better game to play than Tumbling Together! True to its name, Tumbling Together features Tumbling Reels. This means winning symbols disappear after being recorded, which causes symbols from higher up on the reels to fall down into their place. This creates brand new possibilities for big wins without risking any additional credits, and goes on until no new ways to win are created by the new combination of symbols. The possibility for up to 60 free games in the bonus round means at any given moment you could be in for some serious jackpots. What do you think of Tumbling Together? What type of slots would you like to see High 5 Games make in the future? Check out Tumbling Together at Shake the Sky. If you love playing Double Da Vinci Diamonds and Secrets of Da Vinci then this post is for you! 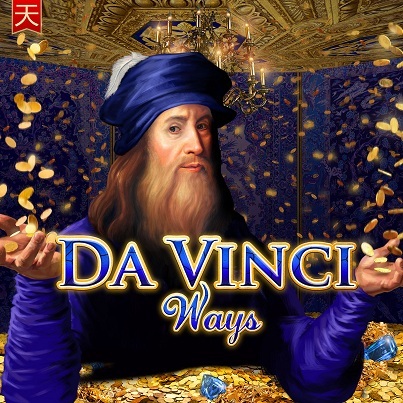 The latest High 5 Games slot to feature the Italian polymath and reels of sparkling diamonds and jewels is Da Vinci Ways, releasing later this week at Shake the Sky Casino. Some slot games draw players in with amazing art design. Others have innovative features. Da Vinci Ways has both! Travel back to Renaissance-era Italy, where you’ll be able to admire some of Da Vinci’s most famous works. The Mona Lisa, Lady with an Ermine, Virgin of the Rocks, Portrait of a Musician, and a portrait of the master himself are depicted so beautifully in this game, you may wonder if you’re playing a slot or visiting a world-class museum! Play Da Vinci Diamonds later this week at Shake the Sky and get ready to win big with 243 ways to win, Tumbling Reels, and up to 50 additional free games in the bonus round! What renowned artist’s works would you like to see depicted in an H5G game? Let us know in the comments section below. 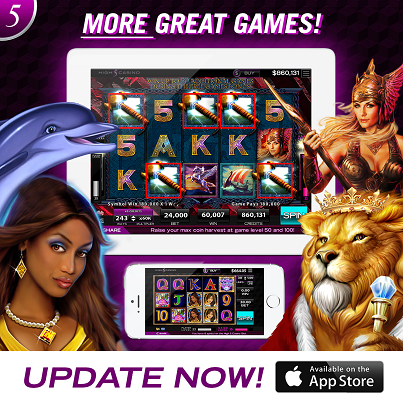 Four more excellent H5G slots debuted at High 5 Casino for iOS last week: Valkyrie Queen, Witches Riches, Twin Win, and Royal Lion. Two of these titles – Valkyrie Queen and Witches Riches – premiered unlocked for all players! That makes 48 premium slots available for on-the-go gaming at High 5 Casino Mobile! Valkyrie Queen, a favorite of our Facebook players, features Tumbling Reels with 243 ways to win so you can collect legendary jackpots while interacting with the mythological queen of the battlefield. In Witches Riches you can hang out with modern-day witches, who use both spells and devilish charm to get what they want, while winning big with Doubled Wild Wins, Tripled Wins During Free Games, and 15 Free Spins in the Bonus Round. If you’re looking for something more summery, take a dive into an underwater wonderland in Twin Win, and emerge with an overflowing bankroll due to Split Symbols! Or you can head to the fantastic kingdom of Royal Lion, where Split Symbols and Connected Lines await you. We hear your cries for High 5 Casino for Android, and we want you to know we’re doing everything we can to release an Android app as soon as possible. Leave us your email at http://wewantandroid.surveyanalytics.com/ , and you’ll be among the first to know when High 5 Casino for Android launches! Make sure to head to the App Store today and download the latest version of our app if you haven’t already; while you’re there, please leave us some feedback so we know what you like about High 5 Casino Mobile and what you’d like to see us change in the future. The search has consumed your life. You’ve been ridiculed and called mad, yet you’ve never given up. After all, if you discover what you’re looking for, it will all be worth it. Just when all seems lost, a new lead appears that seems promising. After a long journey through uncharted territories, you come across a beautiful waterfall where two lovely women wait. Have you finally discovered the Fountain of Youth? 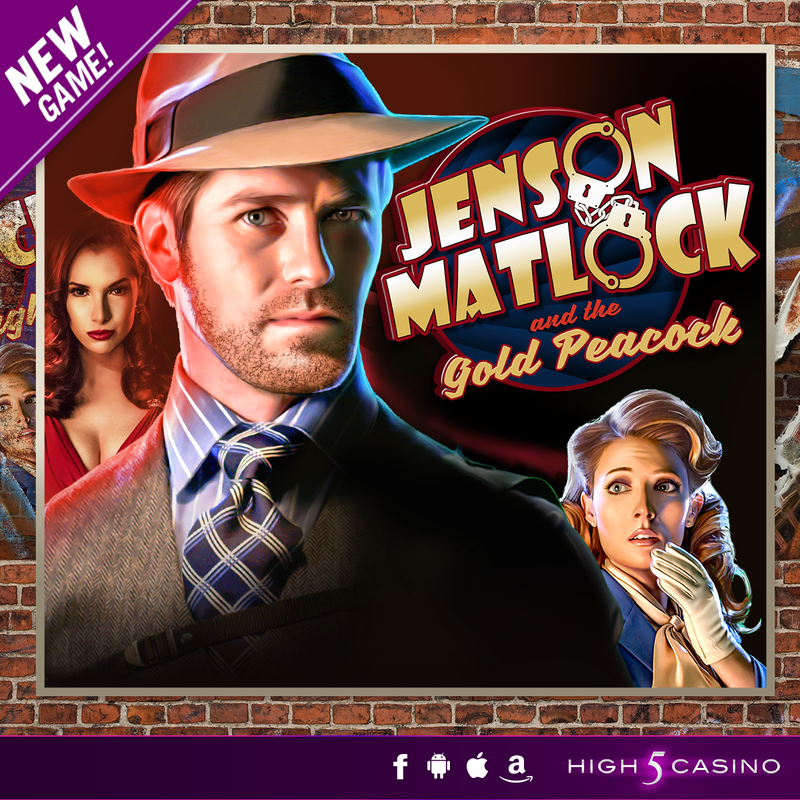 Wellspring debuts as the latest amazing game at High 5 Casino today! 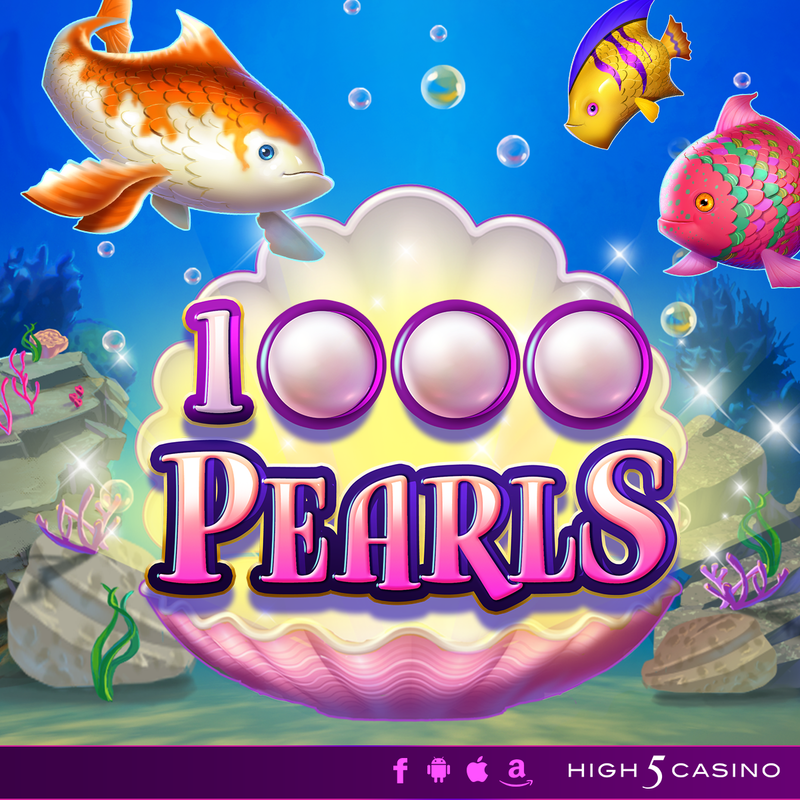 With 90+ slots available to play at this point, it won’t be long before we’re the only casino app on Facebook with over 100 premium games! Wellspring has 243 ways to win and Bonus Select to ensure that you’ll land some reinvigorating jackpots while visiting this mythical locale. I don’t even know if I’d want to drink from the Fountain of Youth, though. Not because of a philosophical concern about death bringing meaning to life, or because I wouldn’t want to live without my family and friends around. But rather because I know I would get to the Fountain of Youth right after some really gross person misread the instructions and bathed in it instead of drinking from it. I’d rather accept my own mortality than drink some random dude’s bath water. What do you think of Wellspring? What type of games would you like to see us make in the future? Play Wellspring at High 5 Casino.